Manifesto Internet (Internet Manifesto) merupakan panduan ringkas dan praktis untuk memahami dunia internet, terutama bagi jurnalis online dan blogger. Internet Manifesto adalah pernyataan terbuka tentang internet yang disusun dan dideklarasikan oleh sejumlah blogger Jerman tahun 2009. Internet Manifesto sudah diterjemahkan ke berbagai bahasa, namun belum ada yang menerjemahkannya ke dalam Bahasa Indonesia. Buktinya, di situs resmi Internet Manifesto, belum ada menu “Bahasa Indonesia” atau “Indonesian”. 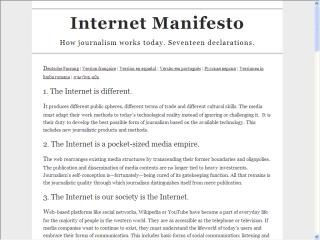 Internet Manifesto ini semacam “panduan bagi jurnalis (journalist guide) untuk memahami internet lebih dulu sebelum terjun ke dunia media online sebagai jurnalis online. Menrut The Guardian, 17 deklarasi tentang masa depan jurnalisme di era internet ini telah dibahas di seluruh dunia. Ada 17 poin deklarasi, diawali dengan penegasan bahwa internet itu berbeda dengan media-media konvensional. Ruang publik, istilah, dan keterampilan yang dibutuhkan juga berbeda. Jurnalis internet pun menempuh proses atau metode yang berbeda dalam memproduksi dan menyebarkan berita. Internet diibaratkan “kerajaan media ukuran saku” (a pocket-sized media empire). Masyarakat saat ini adalah masyarakat internet. Wikipedia atau YouTube sudah menjadi bagian dari kehidupan sehari-hari. Soal kebebasan, disebutkan, kebebasan Internet tidak dapat diganggu-gugat. Memblokir akses ke Internet dinilai “membahayakan aliran bebas informasi” dan merusak “hak dasar tentang menentukan informasi sendiri”. Internet adalah kemenangan informasi. Saat ini setiap orang, melalui internet, dapat menginformasikan diri mereka lebih baik dari sebelumnya. Internet meningkatkan jurnalisme. Melalui internet, jurnalisme dapat memenuhi peran sosial-pendidikan dalam cara baru. Konten internet itu “abadi”. Internet membangun. Online, teks, suara, dan gambar tidak lagi harus bersifat sementara. Mereka tetap ada sehingga membangun sebuah “arsip sejarah kontemporer”. Internet Manifesto juga mengingatkan dan menegaskan, “kualitas tetap kualitas yang paling penting”. Prinsip jurnalisme harus tetap ditegakkan. Berikut ini kutipan selengkapnya Manifesto Internet versi bahasa karena laman resminya sulit diakses lagi. The web rearranges existing media structures by transcending their former boundaries and oligopolies. The publication and dissemination of media contents are no longer tied to heavy investments. Journalism’s self-conception is, fortunately, being bereft of its gatekeeping function. All that remains is the journalistic quality through which journalism distinguishes itself from mere publication. Web-based platforms like social networks, Wikipedia or YouTube have become a part of everyday life for the majority of people in the western world. They are as accessible as the telephone or television. If media companies want to continue to exist, they must understand the world of today’s users and embrace their forms of communication. This includes basic forms of social communication: listening and responding, also known as dialogue. Due to inadequate technology, media companies, research centres, public institutions and other organisations compiled and classified the world’s information up to now. Today every citizen can set up her own personal news filter while search engines tap into a wealth of information of a magnitude never before known. Individuals can now inform themselves better than ever. Through the internet, journalism can fulfil its socio-educational role in a new way. This includes presenting information as an ever-changing, continual process; the forfeiture of print media’s inalterability is a benefit. Those who want to survive in this new world of information need a new idealism, new journalistic ideas and a sense of pleasure in exploiting this new potential. Search engines and aggregators facilitate quality journalism: they boost the findability of outstanding content over a long-term basis and are thus an integral part of the new, networked public sphere. References through links and citations — especially including those made without any consent of or even remuneration of the originator—make the very culture of networked social discourse possible in the first place. They are by all means worthy of protection. Article 5 of the German Constitution does not comprise protective rights for professions or traditional business models. The internet overrides the technological boundaries between the amateur and professional. This is why the privilege of freedom of the press must hold for anyone who can contribute to the fulfilment of journalistic duties. Qualitatively speaking, no differentiation should be made between paid and unpaid journalism, but rather, between good and poor journalism. Once upon a time, institutions such as the church prioritised power over personal awareness and warned of an unsifted flood of information when the letterpress was invented. On the other hand, pamphleteers, encyclopaedists and journalists proved that more information leads to more freedom, both for the individual as well as society as a whole. To this day, nothing has changed in this respect. 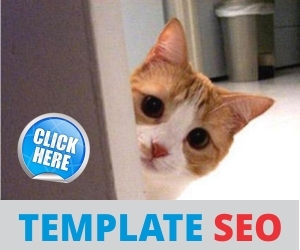 Money can be made on the internet with journalistic content. There are many examples of this today already. Yet because the internet is fiercely competitive, business models have to be adapted to the structure of the net. No one should try to abstain from this essential adaptation through policy-making geared to preserving the status quo. Journalism needs open competition for the best refinancing solutions on the net, along with the courage to invest in the multifaceted implementation of these solutions. Copyright is a central cornerstone of information organization on the Internet. Originators’ rights to decide on the type and scope of dissemination of their contents are also valid on the net. At the same time, copyright may not be abused as a lever to safeguard obsolete supply mechanisms and shut out new distribution models or license schemes. Ownership entails obligations. The internet debunks homogeneous bulk goods. Only those who are outstanding, credible and exceptional will gain a steady following in the long run. Users’ demands have increased. Journalism must fulfil them and abide by its own frequently formulated principles. The web constitutes an infrastructure for social exchange superior to that of 20th century mass media: when in doubt, the “generation Wikipedia” is capable of appraising the credibility of a source, tracking news back to its original source, researching it, checking it and assessing it — alone or as part of a group effort. Journalists who snub this and are unwilling to respect these skills are not taken seriously by internet users. Rightly so. The internet makes it possible to communicate directly with those once known as recipients — readers, listeners and viewers — and to take advantage of their knowledge. It is not the ‘know-it-all’ journalists who are in demand, but those who communicate and investigate.